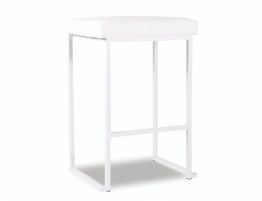 Our Cantona white and stainless steel commercial bar stool features a backless design making it sit tidily and unassumingly beneath counters for clean lines. Upholstered in high quality, durable white faux leather, it is a breeze to care for. A favorite in high traffic kitchens and commercial spaces like clubs, coffee bars and restaurants. 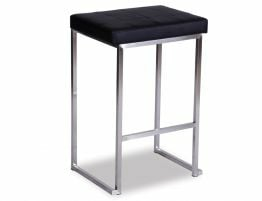 The Cantona commercial bar stool features a stationary seat constructed with plush foam padding making it comfortable to sit in. The seat is upholstered in black and is finished with careful stitching. The Cantona café barstool has a fixed seat height with heavy duty brushed stainless steel welded legs for structure and stability. 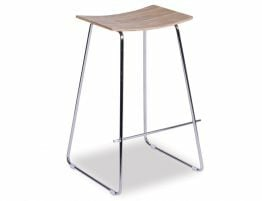 The Cantona restaurant barstool would pair beautifully with a tall café table or an urban, Soho inspired, brushed stainless steel bar counter top. 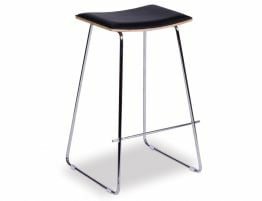 With simple lines and a chic form, this restaurant bar stool fits in nicely with many design esthetics from modern to more casual. 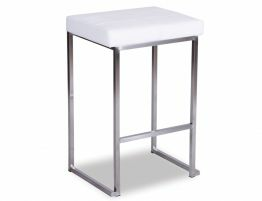 If your establishment leans toward modern, the Cantona bar stool, with its white seat and brushed stainless steel frame will compliment nicely. 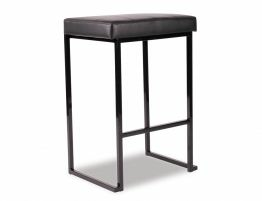 Our Cantona stationary barstool looks high end and ultra-chic but at a very reasonable price tag. Our modern commercial bar stool offers an instant update to your café or restaurant with its stitched white seat cushion and gleaming brushed stainless steel frame.